WASHINGTON, DC, May 24, 2013 (ENS) – Most of the U.S. Environmental Protection Agency’s 17,700 employees are on furlough today to meet the budget requirements of the sequester, but still the agency is recognizing the Friday before Memorial Day as “Don’t Fry Day,” to encourage Americans to prevent skin cancer throughout the summer. Acting EPA Administrator Bob Perciasepe is still on the job today. The agency will “maintain the capabilities to respond to any emergencies,” he told reporters. Joined by the National Council on Skin Cancer Prevention, the U.S. Food and Drug Administration, and the Centers for Disease Control and Prevention, the EPA is raising awareness that skin cancer is the most common cancer in the United States. “If current trends continue, one in five Americans will get skin cancer in their lifetime, and many of these skin cancers could be prevented by reducing UV exposure from the sun and indoor tanning devices,” said CDC Director Tom Frieden, MD. The states with the highest number of melanoma cases include Alabama, Arizona, Colorado, Idaho, Indiana, Iowa, Montana, Oregon, Utah, and West Virginia. To make it easier for people to choose safe and effective products, the FDA last December issued new labeling rules for sunscreen products. These regulations require truth in sunscreen marketing and, for the first time, require that claims of water resistance and broad spectrum sun protection be validated. Sunscreens proven to protect against both ultraviolet A (UVA) and ultraviolet B (UVB) rays can be labeled Broad Spectrum. Both UVB and UVA radiation contribute to the Sun’s damaging effects. Sunscreen products that meet the criteria for being called “Broad Spectrum” and have a Sunscreen Protection Factor (SPF) of 15 or higher may state that they reduce the risk of skin cancer and early skin aging when used as directed with other sun protection measures. Any product that is not Broad Spectrum, or has an SPF below 15, must have a warning stating that the product has not been shown to help prevent skin cancer or early skin aging. New water resistance claims on the front label must indicate whether the sunscreen remains effective for 40 minutes or 80 minutes while swimming or sweating. 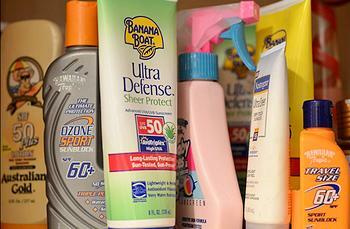 High SPF numbers are no measure of product effectiveness, the EWG warns. 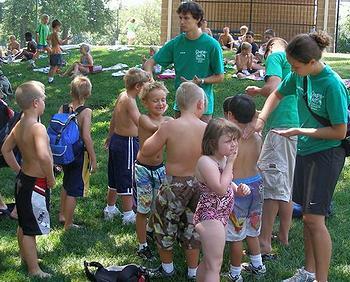 A sunscreen’s sun protection factor, or SPF, measures its ability to screen skin burning UV rays, primarily UVB rays, but the SPF value does not reflect the product’s ability to filter out UVA rays that, according to a growing body of evidence, cause skin damage, immune suppression and possibly melanoma. About one in seven beach and sport sunscreens is labeled with SPF values greater than 50+. The FDA has proposed to limit SPF claims to 50+ but has not issued such a regulation. European manufacturers are bound by a European Union rule that caps SPF claims at 50+. The EWG cites studies showing that high-SPF sunscreen users are exposed to as many or more ultraviolet rays than those who use lower-SPF products. People get a “false sense of security from those big numbers, don’t apply enough sunscreen, wait to long before reapplying and spend too much time in bright sun,” the group warns. According to the CDC and the National Cancer Institute, Americans are increasingly aware of the dangers of overexposure to the Sun’s rays. Yet rates of first-time diagnoses of melanoma have tripled over the past 35 years, increasing 1.9 percent annually since 2000. Americans are encouraged to learn more about skin cancer in their states at: www2.epa.gov/sunwise/skin-cancer-facts-your-state.